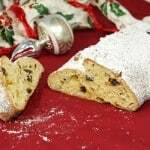 Light and fluffy Lussekatter are a fun to make treat for St. Lucia’s Day and beyond. 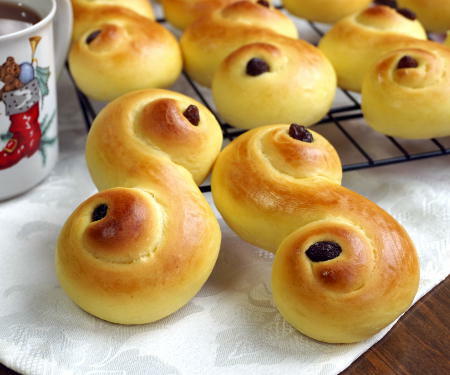 Celebrate the Christmas season with these Swedish Saffron Buns! Sweet yeast rolls are often seen in Sweden, but at Christmastime they take on a new shape and meaning. Saffron gives these rolls a beautiful golden color that is accented by dark raisins. The rolls are lightly sweet, and just rich enough with eggs and butter. 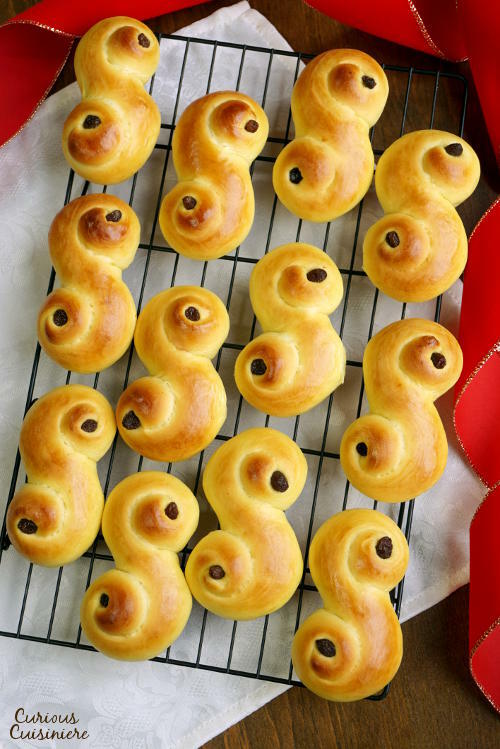 The name, Lussekatter, means “Lucia cats” and comes from the way the scrolled buns looks like a cat’s tail and the fact that they are common to serve on Saint Lucia’s Feast Day in December. Lucia was a Christian girl who was born to rich and noble parents. She was killed for her faith in 304AD. She was known for secretly bringing food to persecuted Christians hiding in the catacombs in Rome. When traveling through the dark tunnels, she would wear a wreath lit with candles on her head, so that she had both hands free to carry food. Fittingly, her name, “Lucy” means “light”. St. Lucia has been celebrated in Italy since her martyrdom. But now-a-days, her feast day is widely celebrated across Scandinavia and in Croatia and Hungary as well. When Christian missionaries came to Scandinavia, the story of a kind girl who brought light and warmth held much appeal to a people who dealt with long, dark, cold, winters. In Scandinavian countries, St. Lucia’s Feast Day became a festival of light, pointing to the arrival of the Light of Christ on Christmas Day. Her feast day is celebrated on December 13th. Traditionally, the oldest daughter of the house dresses up in long white dress with a red sash and wears a crown or wreath with candles on her head. She carries a tray of a warm drinks, cookies, and saffron buns to her family and friends who are celebrating in the house. The dough for our Lussekatter recipe should be soft and supple. 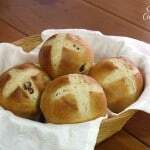 But, when you go to roll out our buns, the dough does have a tendency to spring back on itself. To combat this, we have you roll the pieces a little at a time. Start by trying to coax them to 4-6 inches. Then, after all the pieces have had a chance to relax into that shape, it will be much easier to roll them all the way to 13-14 inches long. Once the dough is rolled into a long snake, simply twist the two ends in opposite directions, creating a loose “S” with two spirals. Then, you can place a raisin at the center of each spiral and let the buns rise before they are baked to a beautiful golden brown! 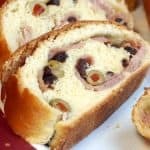 For best results, make your saffron milk and start soaking your raisins 1 hour before you would like to start your bread. Place the saffron threads in a small bowl and carefully grind them into a fine powder using the back of a spoon (or use a mortar and pestle). Add 2 Tbsp of milk and set the mixture aside for an hour or two, stirring occasionally, to let the saffron dye the milk. Place the raisins in a small bowl and cover with warm water. Set them aside to plump. 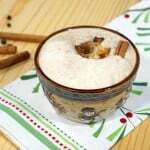 Place the warmed milk in a large mixing bowl. Mix in a few Tbsp of the sugar. Sprinkle the yeast over top of the milk and let it stand until the yeast has softened and begins to foam, 5-10 min. Mix in the remaining sugar, melted and cooled butter, beaten egg, and prepared saffron milk. Add the salt and flour, 1 cup at a time, mixing after each addition. Add just enough flour so that the dough comes together to a knead-able consistency. Turn the dough out onto a lightly floured countertop and knead for 5-6 minutes, adding more flour as needed to keep the dough from sticking to your hands. Once the dough is smooth and soft, shape it into a ball and place it into a clean, greased bowl. Cover the bowl with a damp tea towel and let the dough rise in a warm, draft free place for 60-90 min, until doubled. For each snake, spiral the ends in opposite directions to form a scrolled “S”. 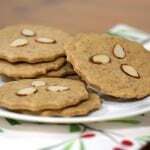 Place the scrolled “S” onto a baking sheet that has been lined with parchment paper. Drain your raisins and place them on a paper towel to dry. (Pat them dry if necessary.) Put one raisin in the middle of each spiral. Continue with the remaining dough. Beat together the egg and water for your egg wash. Brush the mixture on the buns. Let the buns rise in a warm, draft free place for 20-30 minutes, or until the buns are puffy and have nearly doubled in size. Near the end of this last rising time, preheat your oven to 425F. Bake the buns for 8-10 min minutes, until golden. Remove the buns from the oven and let them cool on a wire rack for 5 minutes before enjoying the warm rolls! They look delicious Paul! Thanks for sharing! I have a slightly different recipe for saffron bread. 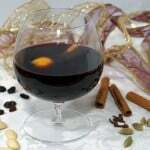 I have looked around on YouTube and it seems that many people use different recipes. Some use cream cheese, some use lots of butter. 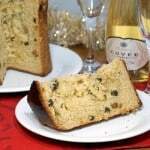 My recipe calls for yeast cakes and 30 almonds as well as 8 cups of flour and a varied amount of sugar. 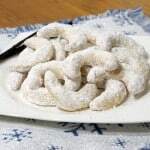 My recipe came from my Aunt’s mother who was from Sweeden.. please help me understand. Is this recipe regoinal? It even mentioned 4 bitter almonds but, those are poisonous?… what is the evolution.? This came from an English translation for at the earliest 1979. Hi Dawn, Thanks for sharing how your recipe varies! I do suspect that it’s a regional variation. We find often with very traditional dishes that it is hard to find one “standard” because every region, and sometimes every household, makes theirs a little different.